A virtual shopping centre based on London's famous Oxford Street and West End consumer hotspots is currently in development, set to open its (virtual) doors in time for Christmas shopping in 2009. "Hell is other people," famously wrote Jean-Paul Sartre, which, were he a Londoner he might well have added, "on Oxford Street in the January sales!" The group that represents West End traders is, according to The Times this week, "creating a unique internet world where shoppers will be able to wander down computer simulations of London streets, click their way into exact replicas of well-known stores, and thumb through goods stacked on virtual shelves." Of course, such virtual shopping malls are already in existence (witness the latest UK venture online at Mallplace, for a good example) but nothing has been created so far that is based on real world locations such as the West End. The aim of the virtual Oxford Street venture is to bring over 600 West End traders from Bond Street, Oxford Street and Regent Street online. The £8m scheme has been masterminded by Alex Wrottesley from Near software who has teamed up with Be Broadband to bring a 'Second Life' style Oxford Street to (virtual) life. "This is the first time that someone has tried to recreate a city just as you'd find it in real life," Wrottesley told The Times. The virtual weather in Wrottesley's "Near London" is set to change according to live Met Office data and shoppers can ping their mates on Facebook or MySpace to go off on joint virtual shopping jaunts together. 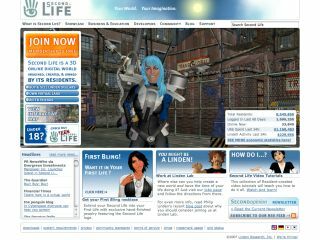 "Near London" is set to open for business by October 2009, just in time for next year's Christmas blitz. Great news for couch-based shoppers and miserable, misanthropic Christmas-hating scrooges everywhere! Whether or not this virtual West End will encourage or discourage shoppers and tourists from visiting the honeypot that is Oxford Circus next winter is still to be seen.